Based on the true story of Alexander Selkirk, who survived alone for almost five years on an uninhabited island off the coast of Chile, The Mysterious Island is considered by many to be Jules Verne’s masterpiece. 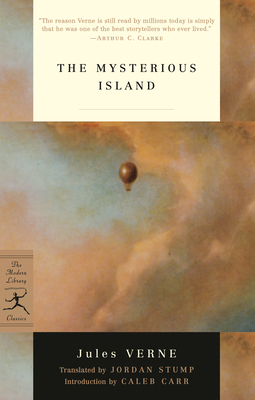 “Wide-eyed mid-nineteenth-century humanistic optimism in a breezy, blissfully readable translation by Stump” (Kirkus Reviews), here is the enthralling tale of five men and a dog who land in a balloon on a faraway, fantastic island of bewildering goings-on and their struggle to survive as they uncover the island’s secret. Jordan Stump is an associate professor of French at the University of Nebraska–Lincoln, and translator of more than half a dozen French novels. His translation of Nobel Prize–winning novelist Claude Simon’s Le jardin des plantes won the French-American Foundation Translation Prize for 2001. Caleb Carr is the bestselling author of The Alienist and, most recently, The Lessons of Terror. He lives in New York.